The Prophet had to spend three days in a fishes' belly to atone for his disobedience. Jesus lay in his grave for the same length of time to expiate the sins of mankind, therefore the two themes have been combined here. The Jonah scene has been cleverly fitted into the surrounding Banderoles and Plant Arabesques. 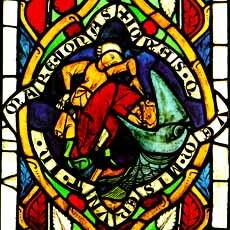 The scene is very dramatic, showing a man forcing the disobedient prophet into the fishes' maw. If you click on the windows, you can see the image enlarged with greater detail. The stained glass windows in the City/Parish church. The Esslingen church history begins after the Evangelical City/Parish church with a simple single-aisled church in the 8th century, which was replaced by ever larger buildings over the centuries. The various phases are documented in the Excavation Museum. The core of the nave which still stands today was built between 1250-65, and shows obvious influences from the architecture of the Mendicant Orders. Instead of a vaulted stone roof, it has a flat wooden ceiling. The two towers flanking the choir, finished around 1300, and their connecting bridge are perhaps Esslingen's most well-known landmark. At the beginning of the 14th century the nave was lengthened and a new choir was built. Here are the vast majority - 226 panes - and the oldest of the medieval stained glass windows in Esslingen; a glowing treasure of many-facetted paintings. The glass panes were made in two, perhaps three workshops in 1280, 1300 and 1330. Rich patricians donated the first set of windows in 1280, but the new High Gothic choir for which they were made was only started by the Speyer Cathedral Chapter, who owned the church until the Reformation, around 1300. In order to accomodate these windows and new ones as well, five quadripartite windows were inserted, which was unusual for this period.